Hinshaw, Simpson, age 21, born in Indiana; keeps grocery [unclear]; $300 real estate; $300 personal property. Hinshaw, Rachel C [unclear], age 24, born in North Carolina; keeps house. Hinshaw, Milly A, age 1, born in Indiana. Hinshaw, Simpson S., age 31, born in Indiana; father born in North Carolina; mother born in Indiana; occupation: "huckster". Hinshaw, Rachel, wife, age 33, born in North Carolina; parents born in North Carolina; keeping house. Hinshaw, Millie A., daughter, age 11, born in Indiana; father born in Indiana; mother born in North Carolina; attended school. Hinshaw, Albert C., son, age 6, born in Indiana; father born in Indiana; mother born in North Carolina; attended school. Hinshaw, Myrtle, daughter, age 1, born in Indiana; father born in Indiana; mother born in North Carolina. Hinshaw, Simpson S., head-of-household, age 51, born Aug 1848 in Indiana; father born in North Carolina; mother born in Indiana; married 31 years; occupation: minister; owned home (free). 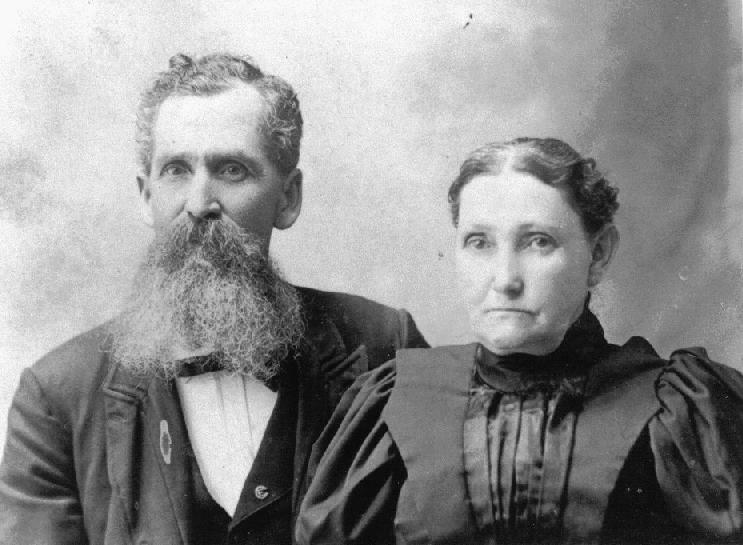 Hinshaw, Rachel O., wife, age 53, born Aug 1846 in North Carolina; parents born in North Carolina; married 31 years; 8 children, 5 living. Hinshaw, Lillie M., daughter, age 18, born Dec 1882 in Indiana; father born in Indiana; mother born in North Carolina. Hinshaw, Henry E., son, age 16, born Apr 1884 in Indiana; father born in Indiana; mother born in North Carolina; attended school 9 months. Simpson Scott Hinshaw died Jun 26 190114,15,23, at his home, Winchester, Randolph County, Indiana14,15,23; age 52y 10m 19d14,15,23 [Fountain Park Cemetery22,24]. Simpson S., Son of Jacob A. and Penina Hinshaw, was born in Lynn, Indiana, August 7, 1848, departed this life June 26, 1901, at his home in Winchester, aged fifty-two years, ten months and nineteen days. 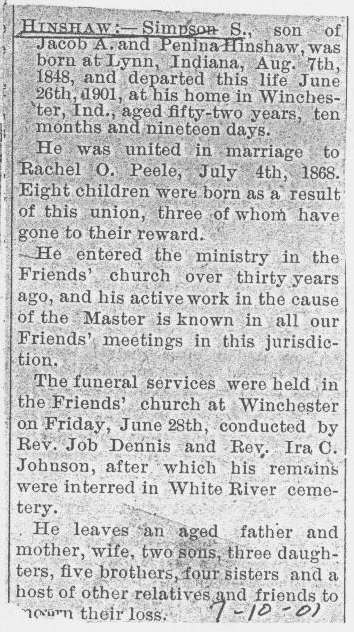 He was married to Rachel O. Peelle July 4, 1868, with whom he lived happily until death separated them. To this union were born eight children, three of whom have preceded him to the sunny clime. He began his ministry in the Friend's church about thirty years ago, and his entire life work has been for the uplifting of the cause of Christ and the church. Although a sufferer for years, he went forth to help the wayfarer and by his earnestness and enthusiasm in the work, hundreds in our state and Ohio have been brought into the light. The funeral services were conducted by Revs. Job Dennis and Ira O. Johnson in the Friends' church at Winchester, after which his remains were interred in White River Cemetery. He leaves an aged father and mother, wife, two sons, three daughters, five brothers, four sisters and a host of friends to mourn his departure. Death of Simpson S. Hinshaw. Simpson S. Hinshaw, the well-known and popular minister of the Friends' church, died at his home in this city last Wednesday evening, after many years of suffering which was borne with great patience. He had not partaken any substantial nourishment for more than forty days prior to his death. 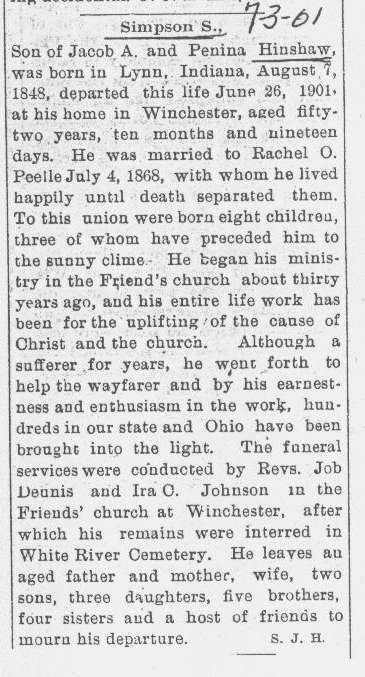 An obituary is published elsewhere in this paper, and leaves us but little to say except to add that his death is the first break in the large family of Jacob Hinshaw except one boy that died in infancy. He was also the only one of the family who was a great sufferer for many years. He has conducted hundreds of revival meetings and by his earnest pleadings and extraordinary eloquence, hundreds of people in Indiana and Ohio have been led into the right. In the language of the text quoted by Rev. Dennis, "He rests from his labors and his works do follow him." Besides the relatives and many friends in this county the following were present at the funeral services: Jacob Replogle and wife, Lon Brunner and wife, Ves Preddy and wife and Ash Kerns, of Cowan; Mrs. Mary Parish, Richmond; Grant Ward and family, Alexandria, and Enos Hinshaw, Hartford City. Albright, Charles, head-of-household, age 42, born in Indiana; parents born in Indiana; owned home; occupation: salesman, dry goods store. Albright, Myrtle, wife, age 40, born in Indiana; father born in Indiana; mother born in United States. Albright, Pauline, daughter, age 18, born in Indiana; parents born in Indiana; attended school. Hinshaw, Rachel, mother-in-law, age 73, born in United States; parents born in United States; widow. WINCHESTER -- Mrs. Rachel Hinshaw, 79 years old, widow of the Rev. Simpson Hinshaw, is dead here after a lingering illness. She is survived by two daughters, Mrs. Charles Albright of this city and Mrs. Porter Chenoweth of Lynn, and two sons, Dr. Earl Hinshaw of Richmond and Albert Hinshaw of this city. Biographical sketch of Albert Clarence Hinshaw. 1870 census, Winchester P.O., Washington Township, Randolph County, Indiana; roll M593-354, page 451A, line #39, dwelling #216, family #216. 1880 census, Lynn, Washington Township, Randolph County, Indiana; roll T9-0307, ED 173, page 271B, line #23, dwelling #141, family #141. 1920 census, Winchester, White River Township, Randolph County, Indiana; roll T625-464, ED 171, page 10B, line #94, dwelling #268, family #269. 1900 census, Winchester, White River Township, Randolph County, Indiana; roll T623-399, ED 136, page 10A, line #37, dwelling #202, family #208. "Abstracts of the Records of the Society of Friends in Indiana", Part 1, subtitled "Encyclopedia of American Quaker Genealogy, Volume VII", (a compendium of many of the records left by William Wade Hinshaw on his death), edited by Willard Heiss; GS929.3 H47 in a local library. 1850 census, Washington Township, Randolph County, Indiana; roll 168, pg 45, household #69. 1870 census, Winchester P.O., Washington Township, Randolph County, Indiana; roll M593-354, page 451B, line #2, dwelling #217, family #217. 1870 census, Winchester P.O., Washington Township, Randolph County, Indiana; roll M593-354, page 451B, line #6, dwelling #218, family #218. 1870 census, Winchester P.O., Washington Township, Randolph County, Indiana; roll M593-354, page 451A, line #26, dwelling #213, family #213. Contribution from Cindy Wallace (). The "Indianapolis Star", May 11 1923; http://www.ancestry.com. Photo courtesy of Cindy Wallace ().